SO WHY SHOULD I CHOOSE GDL DRIVING SCHOOL? Great RatesGREAT RATES: Our maximum rate is £22.50 per hour (for new learners the first two hours will be £10 per hour). At this price we can beat almost everyone. We can afford these rates by teaching locally. 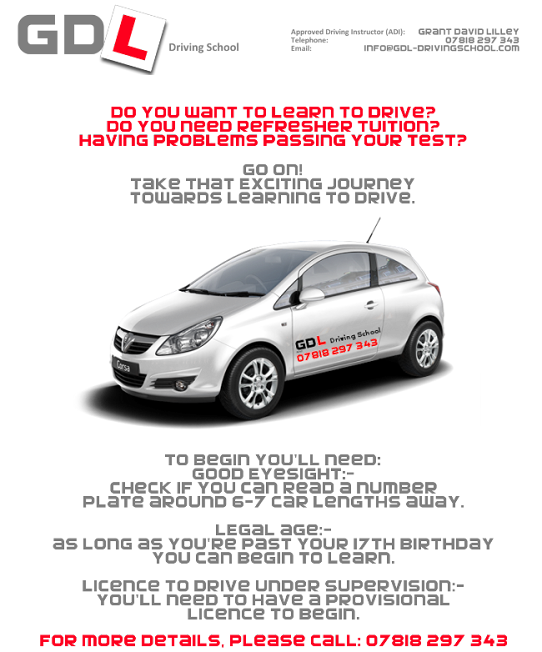 Local InstructorLOCAL INSTRUCTOR: We can afford to keep lesson prices low along with supplying great tuition for practical test routes and the best roads to teach on in Canvey Island (and nearby areas). This means you'll learn on small side streets through to dual carriageways and busy country roads. Intensive CoursesINTENSIVE COURSES: If you really need to learn and pass your test as quickly as possible we can offer courses (where available) where you're taught everyday over a week or two. This is ideal if a job is pending a full licence or you're the type of person who enjoys `cramming' rather than learning at a steady pace. Flexible Booking TimesFLEXIBLE BOOKING TIMES: We're happy to take lessons between 8am through to 5.30pm Monday-Friday. We're also happy to offer lessons from 7pm-9pm on selected evenings. Saturday mornings are also available - but these are on a first-come first-served basis. High 1st Time Pass RateHIGH 1ST TIME PASS RATE: Over 90% of our customers pass first time on their driving test - rather than their second or third attempt! Starter & Refresher LessonsSTARTER & REFRESHER LESSONS: Whether you've never been behind the wheel before and are just starting out, or you need training to refresh a skill which may be poor (e.g. you're a licence holder who hasnt driven for a while and needs to drive again), we can help as we tailor each lesson individually. Patient & Friendly TuitionPATIENT & FRIENDLY TUITION: There's enough pressure on you when you're learning to drive without having to deal with an impatient and/or harsh instructor and this is why we believe the best atmosphere to learn in is a relaxed and friendly one. At GDL Driving School we dont believe in shouting! Air-Conditioned ComfortAIR-CONDITIONED COMFORT: We believe you need a cool head to learn something as challenging as driving. That's why we've chosen an air-conditioned car with a 5-star NCAP safety rating - keeping you not only safe but warm in the winter and cool in the summer.